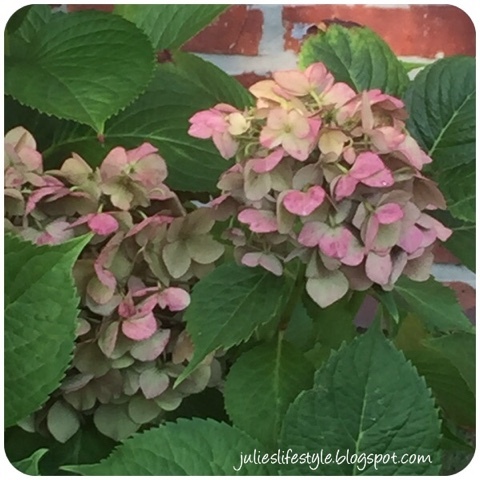 My hydrangea plant has changed it's color to a light pink and won't be around too much longer due to the fall weather. I will miss seeing the pretty flowers until next spring. Oh boy, it really is that time of year! Enjoy the last of the color! My favorite flower...down here most of them are blue. I have saved some and dried them. Mine have changed too and I'm loving how they add to the fall aesthetic outside. I cut some and put them in baskets on the porch too! Beautiful hues in the flowers! Do you bring the flowers in to dry Julie? Then you could enjoy them through the winter too. Your hydrangeas are absolutely beautiful, Julie! I'd be sad too, not to see those blooms! Happy WW! Ohh those are my fave!! I would love to have some in my yard. This is my favorite flower....well one of my many favorite flowers!!!! I'm so jealous of yours! Mine did not bloom this year. I planted it last summer and was hoping it would give me beautiful blossoms this year. The plant looks very healthy though. It is definitely sad to see the flowers go, but it gives us something to look forward to in spring! Mine are a different color, too, now, and I'm enjoying them while they last! My grandmother's favorite flower. Until next spring. Beautiful! Sorry I've been so late in stopping by to say hello. One week away from my Daughters wedding with so much yet to do. But I wanted to take a little time and see what I've been missing!